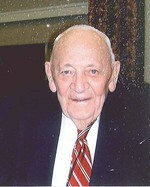 Grover V. Williamson March 7, 1915 - August 25, 2009 Mr. Grover V. Williamson was born in Pikeville, Kentucky in 1915. Mr. Williamson died, Tuesday, August 25, 2009 at The King Home in Evanston, IL. He was educated at Morehead State and the University of Kentucky. He taught school and coached basketball while attending college. Grover later became an executive with then Commonwealth Life Insurance Company, now Aegon. He also was President and Chief Operating Officer of his family's coal and land business, the N.B. and Susan Williamson Land Company which was named after his parents. Grover was married to Loray, his wife of over 60 years. She predeceased him. His survivors are Joel, his son: Cheryle, his daughter in law; Amanda his granddaughter and Tyler Johnson. his four-month-old great grandson. Joel is a partner at Mayer Brown LLP. An international law firm. Amanda is an associate at Skadden Arps, also an international law firm. Cheryle is a former ballerina who has served on the Cincinnati Ballet Company Board and presently serves on The Joffrey Ballet Company Board. Cheryle is an investor. Joel and Cheryle live in Chicago, Illinois, and Paris, France. Amanda lives in Evanston, Illinois Private Funeral Services will be held at Rose Hill Mausoleum in Ashland, Kentucky.